Thank you, Rhonda, for allowing us to visit your school today, and to Marie for giving us both this wonderful ‘Back to School’ experience. Catherine and I are really impressed by what we have seen of Stewards Academy, as we’re both strong believers in schools where the emotional wellbeing of young people is nurtured and protected just as much as your learning and academic skills. It is particularly good to see the role played in this positive culture by Place2Be, a charity that is in the team that Is part of our ‘Heads Together’ campaign. Catherine, Harry and I have decided that we can use our positions to make a difference on the subject of mental health. It should not be a taboo subject in the year 2016. 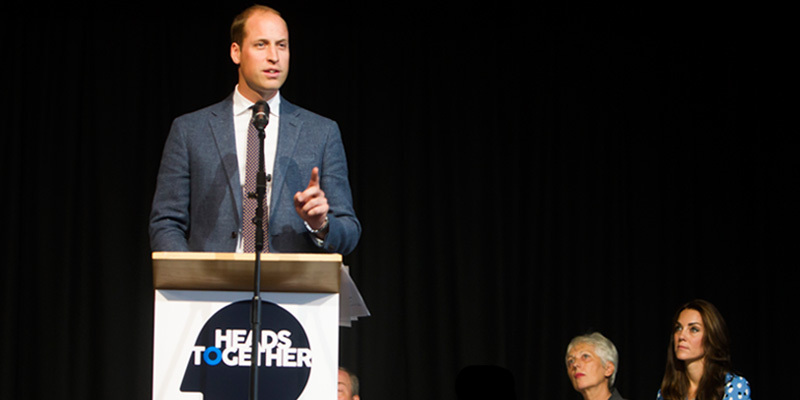 So, the Heads Together campaign is all about getting people talking about the difficult times that many of us will face and have faced in our lives. Talking can make us realise that we’re not alone. The opposite of talking is isolation and fear. Sometimes getting something off your chest is an important step in coping with a situation – so you know that you’re not alone, you’re not failing, and that it is perfectly normal to feel overwhelmed or sad at times. Everybody does. To be honest, if we could end the old fashioned idea that feeling down is something to be ashamed of, something that you shouldn’t burden others with, we would make our society a much happier and healthier place. Everyone needs someone to turn to – even if it’s an anonymous phone line or web chat service; or a friend, teacher or family member. Someone who you can trust. That’s what we are working towards – we know it’s a big ambition, but we think it’s very, very important. One moment that our campaign wanted to recognise was how tough it can be when young people go through major changes in their life – such as moving schools. For many of you who have just made the move, this will have been a positive and happy experience. But for some, it is hard to move from the comfort of a school that you know, surrounded by friends, to one that is new, unfamiliar and so much bigger. So, Catherine and I were really pleased to learn about your buddy system just now, and we hope it means that you have a happy and fulfilling time at school. We hope that it helps bring about a habit in your life of turning to someone when you need help, as that will be just as important to your adult lives as academic success. One final word – about your parents. The Heads Together campaign is for them, too. We know that parents sometimes don’t know how to help their children open up and talk about difficult times. Heads Together has today published, on its website, some top tips for parents – to help them talk to their children about big changes you may be going through. We hope this is helpful. So thank you, Stewards Academy, for supporting the Heads Together campaign. When we get our Heads Together – when we talk to one another – we can get through the big changes together and achieve great things. Good luck, all of you, this school year. Thank you.